Is life really pure? Absolutely, if you live in the right place. And now is the opportunity to purchase a Costa Rican Estate at Absolute Auction, meaning that the property will be sold regardless of price on auction day. Welcome to the providence of Heredia, known as “The City of Flowers,” where you will find charming little towns surrounded by coffee plantations, rich tropical flora and breathtaking views of the Central Valley and San Jose. 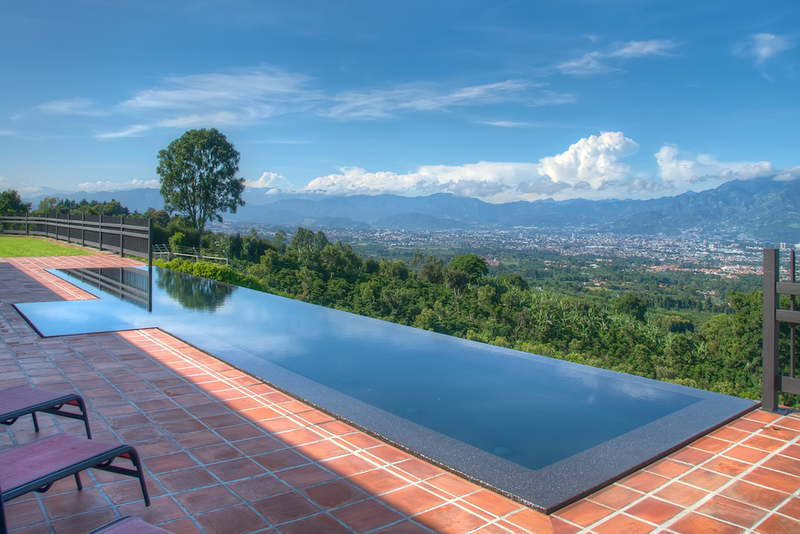 Above the winding streets of Heredia, you will also find the “Atrium House,” a private mountain estate with stunning panoramic city and mountain views. The defining feature of the home’s architecture is a lavish 20-foot by 40-foot core glass covered Atrium with dramatically vaulted ceilings clad in travertine marble, centered on a courtyard fountain sculpted from opulent black granite. The Atrium is covered by a custom engineered steel support structure with high tech self-cleaning and solar-E glass, which has the option to be totally open to the rest of the home or closed off by a frameless European sliding glass wall system that separates the central area of the home from the private and social area. The marble lined main entrance draws the eye through the home’s elegant centerpiece, the open-aired sitting area of the atrium to the infinity pool that seemingly disappears into the views of the Central Valley. The home’s kitchen features top-of-the-line cabinetry and appliances, including two dishwashers, an electric oven and a 6-burner gas cook top and two refrigerators. The kitchen also features elegant marble countertops coupled with open space and clean lines for both functionality and an open view to the nearby sitting room. Each of the main home’s five large open-and-airy bedrooms comes with a full bathroom and dual vanity, warm marble tiles and lifestyle shower features. The large windows in the bedrooms provide magnificent lighting and incredible views. The infinity reflecting pool is truly dramatic and the outdoor patio is the perfect area to entertain. A small drainage trough around the pool perimeter balances the water level to that of the surrounding terrace for an incredible, clean horizon effect. The home is located only 20 minutes to San Jose and 20 minutes from the airport. Nestled on the southern slopes of the Central Valley, it is a relaxed, private tranquil setting, surrounded by rich tropical coffee and fruit plantations. The property sits on 2.579 acres facing southwest so that the home is bathed in natural sunlight all day. Auction Site: The auction will be held at the property. Directions are available through Google Maps, at the bottom of the Casa Pura Vida webpage. Auction Registration: Registration begins at 9:00 A.M. on Auction Day. Auction begins at 10:00 A.M. Terms: Ten percent (10%) down Auction Day with closing on or before July 10, 2017. Certified funds in the amount of $100,000.00 will be required to bid. The certified funds may be in the form of a Cashier’s Check made payable to the bidder, or a personal or company check with a Bank Letter. Auction Fee: A 10% auction fee will be added to the high bid price to arrive at the contract price paid by the purchaser. Broker Participation: Broker participation is welcome. Call for guidelines: (800) 434-1654 or (256) 543-1654. Don’t miss the opportunity to bid on this magnificent architectural masterpiece selling at Absolute Auction – Regardless of Price! Auction to take place on – site on June 19th.